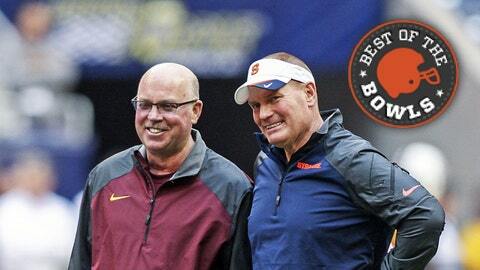 Jerry Kill and Scott Shafer both had reasons to smile in 2013. Philip Nelson pass for 6 yards, David Cobb run for 1, Nelson pass incomplete, punt. Cobb rush for 9 yards, then for 6, then for 2, Donnell Kirkwood rush for 5, then Isaac Fruechte fumble. Nelson removed for Mitch Leidner, two more Gopher punts, then, mercifully, a field goal. Now ask yourself: If you are Jerry Kill, and you watched that first half, what would you do? Kill, Minnesota’s head coach, spent the first 30 minutes of the Texas Bowl like he spent the Gophers’ final six games of the regular season: in a box, high above the field, coaching but not really. It’s been one day shy of three full months since Kill last coached on the sideline for Minnesota, which was Sept. 28 against Iowa. Since, Kill has eased off the football pedal a bit so he could apply more time and energy to his epilepsy treatment after he suffered a seizure the following week before a game against Michigan. It was his third such incident in his three years in Minneapolis. At halftime against Syracuse, he had waited long enough. Kill moved down from the box to the sideline for the second half, hoping maybe that would provide a little energy, maybe a little confidence, hopefully a renewed focus. OK, at the very least, maybe it would just change the luck. Whoa, the person running the Minnesota football Twitter account got a little carried away. Sir (or ma’am), can you please clarify? Still incomplete, but that’s a little better. Yes, Leidner threw a TD pass to Maxx Williams. After a failed two-point conversion, the Gophers trailed 14-9. How badly did Minnesota need that TD? Well, sure, it was important for this game, but it also ended a 13-quarter drought. The Gophers hadn’t scored a TD since Nov. 9 against Penn State. Now after a three-and-out by the Orange, they get the ball back. Hey, Minnesota Twitter person, our satellite went out. Can you fill us in what happened next? That would be freshman Drew Wolitarsky, and that would be his first career TD. It’s also Leidner’s second TD pass of the fourth quarter, which doubles his regular-season output for 2013. Because the Texas Bowl is strange and has a mind of its own. A two-point conversion makes it 17-14 Gophers with 12:43 to go. This is starting to feel too good to be true, isn’t it? A triumphant return to the sideline for the head coach, a freshman throwing a long TD to another freshman, a bowl win right there for Minnesota in Reliant Stadium? The Gophers won their first four games of the season, lost the following two and then won another four in a row. They were 8-2 in late November. Minnesota. It was a great story, and while I don’t want to make too much of the “playing hard for Coach Kill” thing, I do think defensive coordinator Tracy Claeys should be recognized for his efforts as acting head coach while Kill stepped away to focus on his epilepsy. Together, Claeys and Kill helped Minnesota win eight games, the most since it won 10 in 2003 under Glen Mason. After that 8-2 start, there was hope Minnesota could reach the 10-win mark again, which would have been only the second time in the last 108 years the program has done it. That shot was probably blown by losing the homecoming game to Iowa in September, because consecutive wins against Wisconsin and at Michigan State to end the season was too much to ask. Whatever the case, it didn’t happen, and so the Gophers will give it another go in 2014. It’ll be tough again, with road games at TCU, Michigan, Nebraska and Wisconsin, but who knows? This season felt like a step off the bowl bubble the Gophers perpetually find themselves battling and into something better. I’m interested to see what next year holds for Kill and his crew. It took Marrone two 8-5 seasons at Syracuse (with 4-8 and 5-7 campaigns mixed in) to land a NFL coaching job in Buffalo, and now his former defensive coordinator, Scott Shafer, tries to pick up where he left the work. A 6-6 regular season – in ‘Cuse’s first season in the ACC — topped with a Texas Bowl win is a solid way to start. Syracuse struggled offensively this season – I know, this isn’t a surprise to you after watching it against the Gophers – ranking 102nd in yards per play (5.09), but there’s some hope heading into 2014, as quarterback Terrel Hunt will be a junior and could have two more seasons on campus. The Orange are still piecing together their 2014 conference schedule, but we know they get Villanova at home, visit Central Michigan and play Notre Dame at MetLife Stadium in New Jersey. Those last two games sandwich a home game against Maryland. Maybe it’s ambitious, but I can envision a 3-1 record in those four. That would give ‘Cuse a shot at topping the seven wins it recorded this season and drumming up more interest in a program that has nothing but opportunity ahead of it by moving to one of the nation’s major conferences.